I’ve been impressed by both the quality and sheer number of outboard processors manufactured by Polish company IGS Audio in recent years. They now have a very wide range of vintage-inspired preamps, EQs and dynamics processors, in both valve and solid-state ‘flavours’ and in 19-inch rackmount and 500-series form factors. They even sell their own LA2A-style photocell, which is used in their own compressors, for others to use. 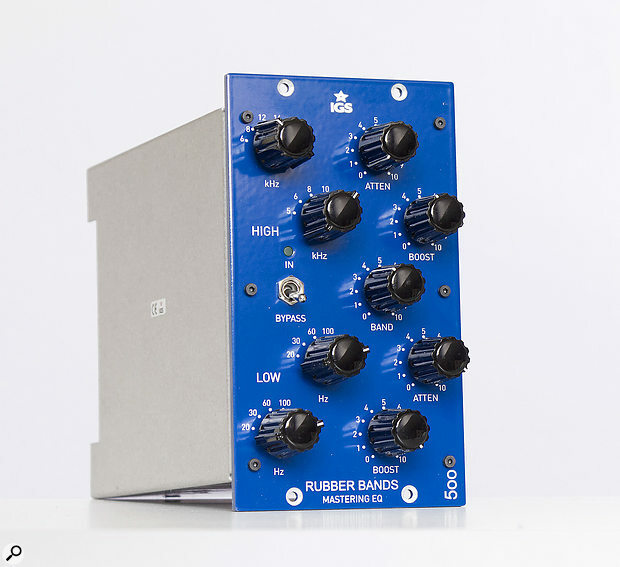 The latest of their products to make its way to me for review is the Rubber Bands 500 Mastering Edition, to give it its full name — but let’s call it the RB 500 ME. This is one of several Rubber Bands EQ products, all of which are loosely based on the passive circuitry of the famous PulTec EQP-1A Program Equalizer. A skim through SOS issues from the last few years shows you that quite a number of PulTec-inspired EQs are now available, but that they’re not all the same. In fact, they vary enormously in how far they adhere to the original design. Some feature the tube make-up gain stage (the filter stages are always passive), for instance, while some replace the tubes with solid-state amplification, and yet more remain passive, requiring you to add gain in the next stage of your signal path. Another variable is the use of input and/or output transformers: some use ICs to do the job of balancing the signal, and those that do employ transformers might use different types from different manufacturers and at different prices. Some cut costs by employing variable resistors, where others use expensive switched. And so on. Such changes can add up to make some of these units sound very different from others, and this is all before you start to look at the filter circuitry itself and the range of frequencies on offer. The early PulTec units were designed for correction of long-distance analogue telephone lines, so it stands to reason that music makers might find a few more options useful! Being a stereo EQ, the RB 500 ME comes in the 500-series ‘double-width’ format. The circuitry is set out neatly on three PCBs: one card per EQ channel, and one for the front-panel controls. The wiring is neat, the front panel suitably rigid and the switches reassuringly solid. The whole unit already inspires confidence before you’ve gone to the bother of installing it in a 500-series chassis. 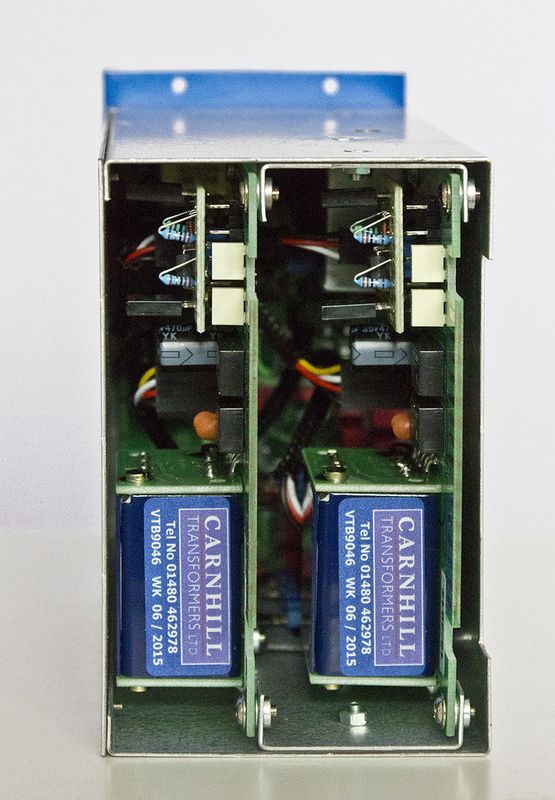 Chunky Edcor input and Carnhill output transformers are employed on each channel, so there are four transformers in total and these occupy much of the space inside the unit. It eschews the valves in favour of a Class-A solid-state gain stage. If that decision isn’t to your own taste for any reason, then it’s worth noting that IGS also manufacture a version with a tube gain stage in 19-inch rackmount form. This device is billed by IGS as a ‘mastering EQ’, hence the ‘ME’ suffix, and while any decent stereo EQP-1A-inspired EQ is going to be of as much interest for tracking and mixing duties, IGS have included some features that could potentially hold more specific appeal for mastering engineers. These include things like switched frequency-selection controls (high-quality ELMA switches are used), and an interesting choice, particularly in the high-frequency band, which I’ll discuss in more detail later. 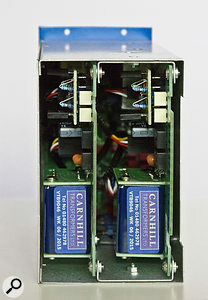 The module is covered on both sides by its metal case, but from the rear you can see the pair of Carnhill output transformers (bottom) and the discrete gain stage (top). I won’t bore you with a detailed tour of the physical controls because they adhere loosely to the usual PulTec paradigm, with individual controls governing boosts and cuts for both LF and HF bands, and all are cleanly labelled in an easy-to-read format. While the frequency selectors are switches, the gain, attenuation and HF bandwidth controls are all variable pots. It’s worth explaining how IGS have, quite deliberately, departed from the EQP-1A design in a couple of respects. One aspect of the classic EQP-1A interface that I’ve really liked over the years is that the low-frequency boost and cut controls operate at the same centre frequency — the frequency is selected using a single control that’s common to both filters. The different nature of and interaction between the boost and cut ‘curves’ means that the boost and cut don’t simply cancel each other’s effects but complement each other beautifully. It’s easy to dial in a substantial low-end boost, for example, and to shape that boost using the cut control: on a frequency response plot, it looks like a broad bottom-end boost with a neat little dip to its right. In sonic terms, this means that you can apply quite radical boosts while also preventing things sounding overblown or muddy, and it just sounds ‘natural’. Furthermore, because of the shared frequency control, the resulting ‘curve’ can be rolled up and down the spectrum swiftly and with ease. It’s a trick I use frequently on kick drums and bass instruments, but it has also proved incredibly handy on more complex stereo material, which often displays a tendency to sound bloated and boomy if boosting the bottom end with a conventional shelving EQ. Of course, while this feature has plenty to recommend it, it also makes the EQP-1A of more limited utility in some applications. IGS decided it would be preferable, therefore, to offer the user independent control of the LF boost and cut frequencies. While this obviously sacrifices the ability to move the boost/cut curve with a single control, it makes for a much more versatile tool. Yet because the two controls are switched, and because they select from the same range of frequencies, you’re still able to set the boost and cut to the same frequency, and you can still move both by the same increment very easily — albeit with two turns of a knob instead of one. Personally, I prefer the IGS approach; it makes it possible to create very different EQ curves if you wish, while sacrificing very little of the EQP-1A functionality. This IGS version also adds some low-frequency options, which is particularly useful given those independent low-band frequency selectors: in addition to the typical menu of 20, 30, 60 and 100 Hz offered by the EQP-1A, both controls for the RB 500 ME add 180 and 240 Hz. At the other end of the spectrum, the EQP-1A already offered independent boost/cut frequency selection, and the RB 500 ME does the same. Again, though, there are different options from which to choose. Where the EQP-1A typically offered 3, 4, 6, 8, 10, 12 and 16 kHz options for the boost, the RM 500 ME gives you 5, 6, 8, 10, 12 and 15 kHz. However, when it comes to the HF-attenuation options, the IGS unit’s 6, 8, 12, 16, 20 and 24 kHz hold far more promise than most EQP-1A homages — the choices are more numerous and extend higher up the spectrum. When you consider how this filter interacts with the HF boost, this all adds up to you having far more control over the high end than with a typical clone. I used the IGS RB 500 ME for several weeks on a range of material, including commercial stereo tracks, stereo buses in my own mixes and a range of individual sources — while it’s billed as a stereo device and the controls operate on both channels at once, it’s perfectly possible to use one channel of this EQ to shape mono sources, such as kick or bass guitar. I also used a frequency analyser to see just what those curves looked like when setting the LF boost and cut to different frequencies, and attenuating the high end. The first thing to say is that this EQ sounds every bit as smooth, classy and effortless as the build quality leads you to anticipate. It’s clean and quiet, with no unpleasant audible distortion or unwanted clicks and pops when using the switches. There’s just a hint of sonic thickening from the transformers if you feed a ‘hot’ signal into it or opt for radical boosts from the EQ itself. But this is unobtrusive, which is just as it should be for something billed as a mastering processor. Instead, most of the character and attitude that this device can inject comes from those classic PulTec-style boost/cut interactions, and IGS’s choice of frequencies have been very well judged in my view. At the bottom end, I was able to do the kick/bass-manipulation trick I mentioned earlier with ease, and I found the higher-frequency additions (180 and 240 Hz) were useful. It enabled me to dial in a rather lower boost, while cutting for clarity in a region that I find often requires it. But it was the control this EQ afforded me over the high frequencies that really stood out — it made really smooth work of brightening and rolling off the top end and never sounded like it was straining to achieve the results I wanted. I could see a long-term role for this on the stereo drum or master bus while mixing, as well as the intended mastering applications. I like this EQ a lot. Much is made about ‘authenticity’ in recreating classic designs such as the EQP-1A, but that debate misses the point entirely. We don’t always need tubes, and don’t always want transformers to saturate. What we do need is great-sounding tools that allow us to get the job done with ease, and the RB 500 ME ticks those boxes. It’s been tailored for use on stereo material not only in terms channel count, but also in terms of the frequencies on offer, which are much better suited to complex material. Some engineers might have preferred switches to pots for the gain/attenuation, but I prefer the latter, which I find less restrictive. It’s not quite in ‘impulse purchase’ territory, but it’s great value for a stereo EQ of this quality, and not much more than many high-quality mono EQs. All in all, then, I’ll give the RB 500 ME a big thumbs up. There are countless PulTec EQP-1A clones out there now in 19-inch rackmount format, but stereo versions are all more expensive than this IGS model. For the 500-series format there are fewer options. A-Designs, Cartec, Lindell and IGS, amongst others, make mono versions but, to my knowledge, fellow Polish manufacturer Bettermaker are the only other company to offer a stereo PulTec-based EQ design, and theirs is a very different beast. An alternative stereo EQ worth consideration for similar duties is the Elysia XFilter. Separate, switched frequency selection controls for LF boost and cut. Judicious choice of frequencies in the different bands. No-nonsense design and impressive build quality inside and out. Very clear labelling of the controls. Separate frequency selectors mean the classic LF-curve sweep trick of the PulTec requires two controls instead of one. A very thoughtful take on the enduring EQP-1A design, the RB 500 ME stereo 500-series EQ adds useful functionality and frequency options for complex stereo material. It also boasts great build quality — and all for a very reasonable price. 895 Euros (About $999 when going to press), excluding tax and shipping.